Community services are essential to support people to overcome challenges and prevent them becoming isolated, vulnerable and impoverished. They tackle the causes of disadvantage and give a voice to the otherwise ignored. Victoria’s community services help create strong, cohesive and inclusive communities, where everyone is supported to overcome barriers and fulfil their potential. Funding, pricing and indexation might sound dry, but getting underlying conditions right can make all the difference for community services organisations to get on with the job. Government funding provides around half of community services income. The rest is donations, grants, bequests and service fees. Public funding appropriately comes with a high accountability. Sometimes the reporting requirements – enforced by service agreements, program guidelines, laws and departmental policies – mean community services must report the same information multiple times, in different formats to different departments, or sometimes even the same one. This duplicated bureaucratic burden is costly, and detracts from the work organisations do at the coalface. The 10-year Community Services Industry Plan aims to reduce overlapping reporting requirements, and allow services and government departments to focus their efforts on achieving better outcomes. Community services are continually frustrated by short-term funding contracts. Major funding departments use a standard service agreement lasting four years, supplemented by many short-term contracts. These short-term arrangements often roll over repeatedly. This increases uncertainty for community service organisations and their staff, who must constantly spend time reapplying for funds. It also means employees have short-term contracts, producing high staff turnover and disrupting relationships with service users. The Productivity Commission’s Report on Human Services recommends a seven-year default contract to overcome these problems. Moreover, community services need fair prices for their services. Government-set prices often fail to cover the full cost of services, including necessary back office expenses. The Victorian Government is reviewing community service price-setting methods. 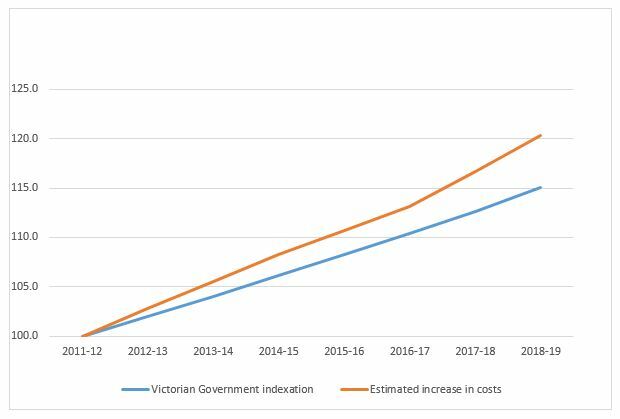 Consultations have occurred with the community sector to establish a community services pricing framework for Victorian funding departments. The value of funding shrinks without proper indexation. Recently, funding has grown more slowly than costs. The chart below shows the shortfall. The Premier, at the VCOSS summit, agreed to partly address this if Labor is re-elected. VCOSS hopes that all political parties believe community services should be paid a fair price for their services. With streamlined accountability requirements, longer-term contract periods and reasonable pricing and indexation, community service organisations can focus on designing and delivering effective services for Victorians.